Extra Bonus! Kids 16 And Under Are Free! Regular Rate $1512 . Today Only $399! Guests will also be able to enjoy a wide variety of the best national and international liquor premium brands and refreshing cocktails. Their bartenders use fresh juices and decorate the cocktails with a fusion of colors and flavors, giving a special touch and quality to every drink served. Popular drink favorites, beers, and an extensive selection of the best wines can be tasted at any of the Resort bars. Guests can start with a welcome cocktail at the exotic Kilimanjaro Lobby Bar. They can also enjoy the Oktoberfest Bar, Le Vin et Fromage, and Paola`s Sports Bar, which are just some of the options that you can find while walking by the Via Veneto. Others like the Bora Bora lunch and snack bar, the Squalo and Samoa Swim-up Bar, and the Bongo beach bar are distributed around the pool area. Located on the second floor, Guests will find the fun and exciting Karaoke Bar, and, in the adults only pool, the Caribe Bar. Great hotel-large rooms, excellent food, lots of activities(great entertainment team!) for kids and adults, very clean, great service, beautiful pool and beach areas. Husband and I, and kids 11yrs and 8yrs had a lot of fun! (Volleyball, basketball, surfing, water polo, games, karoke, contests, mini golf tournament,water aerobics, shopping, shows-something for everyone! )So many dining choices and food was always available somewhere, and we were able to order room service every morning to eat on the balcony to enjoy our ocean view. We will be going back! After a day in the brilliant Cancun sun, relax in the contemporary beachfront accommodations. Each of our all-inclusive rooms and suites features thoughtful amenities and a stylish tropical decor complemented by tasteful furnishings and cool splashes of color. Try every one of the 10 incredible restaurants, each one offering a different specialty to tempt the most discerning palate. Choose among a deli, food court with 12 dining stations and a la carte dining at a traditional Mexican restaurant, teppanyaki grill, steakhouse, crperie and elegant international eatery. Cool down at any one of the 11 bars with a specialty of the day or your old favorite including a game room, karaoke bar and wine bar! Oceanfront food court features breathtaking views and is open for breakfast, lunch, and dinner. It boasts 12 different cuisine stations with a fusion of flavors for every palate. Some of the specialties are Japanese, Mexican, Vegetarian, Grilled Items, Italian, Sea Food, Fruits, and Salads, plus an extravagant deserts and cheese counter. A casual New York-style Restaurant located in the Via Veneto, and is open for breakfast, lunch, and late night dinner. The restaurant is sure to be a hit with the kids with its popular lunch buffet. After playing in the `Treasure Island` Water Park, your little ones will enjoy this delicious food that can be served in child-sized portions. Takes you back to the days of small Spanish villages where family and friends got together to share excellent food. Today at El Maguey enjoy innovative cuisine, outstanding wines, and exquisite traditional Mexican appetizers are all created with traditional ingredients. Open for lunch. An a la carte restaurant offers Guests a fresh approach to dozens of Italian varieties at the peak of their seasons, including appetizers, salads, soups, fowl, meats and a large selection of desserts. Is a traditional a la carte Tepanyaki Japanese Grill Restaurant, and the menu features the finest Japanese dishes, both traditional and contemporary, including a wonderful selection of appetizers, sushi, teriyaki and more. Sit down at the Sushi Bar and let the chefs prepare wonderful a Sushi dish for you. They pride themselves for having creativity in delivering unique and exciting Japanese cuisines. is a fine dining a la carte Steak house serving the best steaks and ingredients available. 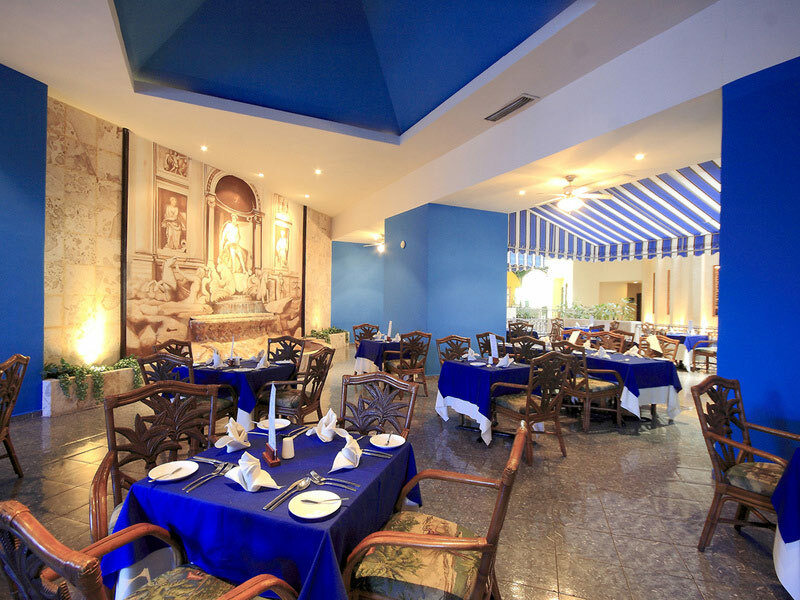 Is a charming and elegant a la carte Gourmet International cuisine restaurant. The staff has created a nouvelle French menu featuring delicate flavors from luxury French ingredients. Le Maison de Michelle is located in the Via Veneto. A cozy corner cafe, serves an extensive list of cappuccinos and desserts such as pastries, layer cakes, extravagant hand-decorated pies, and sweet crepes. Fresh-baked loaves of bread and ice creams are also available. Is an Elite lounge exclusively for Guests staying in suites and Club rooms. The people, the worker's are just wonderful here I cant say enough about them, they really treat you like a King! We booked through BookVIP and the whole experience was really really good and this one of the best vacations we have ever had! "Absolutely fantastic holiday at the Great Parnassus!!!!!" The hotel is not far from the airport, 20 minute transfer only which was fab, the bedrooms are very spacious with great views of the carribean sea. We arrived back from our holiday yesterday, our 3 children have been crying to go back to this hotel, they were busy non stop the whole time we were there. The entertainment team were exceptional everyday, Kuko, Edgar, Ross, Alfredo, Bennie and Angel did an amazing job with entertaining the guests around the pool, we made great friends with the staff who could not do enough for you. Emiliano is a waiter in the buffet restaurant and he made us welcome every morning and we exchanged words, he was developing his English and I was attempting more spanish. The staff work so hard to keep up the fun, safe and exceptionally clean surroundings. There is a vast amount of food to choose from and all exceedingly good. We now have the holiday blues but have kept in contact with some of the staff through email and social media, we really have made some great friends. We will return here ASAP. Great hotel-large rooms, good food, lots of activities(great entertainment team!) for kids and adults, very clean, great service, beautiful pool and beach areas. Weather wasn't great but had a great time anyways. Husband and I, and kids 11yrs and 8yrs had a lot of fun! (Vollleyball, basketball, surfing, water polo, games, karoke, contests, mini golf tournament,water aerobics, shopping, shows-something for everyone! )So many dining choices and we were able to get a paper documenting my son's peanut allergy to make sure his dishes were safe for him. Food was always available some where, and we were able to order room service every morning to eat on the balcony to enjoy our ocean view. We will be going back! "The Most friendly and entertaining hotel in Cancun." Best 2 week holiday ever. Enter as a stranger leave as a friend. From the minute you arrive the staff can't do enough to help you. The Entertainment team are 2nd to none. Edgar,Alfredo,Ross and Benny make us want to return many more times. Great value for money. Three girlfriends and I stayed at Great Parnassus for 5 days, and I think it was awesome!!!! Of course it was hot there, but I wasn't expecting anything less. It was definitely a great value and the staff was very accommodating. I can't recall every name, but Edgar, one of the activities directors, was very friendly and awfully helpful. As was Luz. The guests were like family to me; easy to talk to, and if we recognized one another again, we would stop to chat about our stay, which we all seemed to be enjoying. The Theater hosted awesome shows, like the break dancers, and the Michael Jackson tribute-wow!!! I didn't have enough time at Great Parnassus and I so look forward to returning. The karaoke bar was outstanding. Though it wasn't the grandest hotel there, I loved Great Parnassus. I did get to some of the markets, but I have yet to go to Chichen Itza, and take in some of the other sights. Thanks everyone at Great Parnassus for making my stay so memorable!!! Long live Cancun!! "Fantastic Hotel in a Cruise Ship Style"
My husband, myself and our 2 children ages 10 and 12 stayed here for 7 nights and 8 days along with another couple and their 12 year old. We had a fabulous trip. From the flight to the transportation to and from the hotel and especially the people at the hotel were all so friendly and helpful. We especially enjoyed Abigail the drink server by the main pool and Fernando the lobby bar bartender. They were so nice and professional and loved their jobs. During our stay we also rented jet ski's and charted a 4 hour deep sea fishing excursion, it was great!! Kids loved it, but if you get motion sickness I wouldn't recommend. The Spa was excellent, I had a 50 minute relaxing massage on day 2 with my daughter and a hot stone massage for 80 minutes on the next to last day. They had great deals and offered 20% discounts after you have any service from the spa and we had our first messages at a 2 for 1 price. Totally recommend having a pampering session. Variety of food was good, the outside grill by the main pool had the best food and we enjoyed the Japanese restaurant the best also. It was nice not having to make reservations or to dress up for dinner as some resorts we had previously visited. We didn't mind all the walking around the grounds, because of all the good food it was nice to get some exercise. The only negative comment is that the noise from people going around the floors in the wee hours of the morning like 2 am was loud, and for a family resort I think should have been policed better. "Amazing All-inclusive Hotel, LOVED IT"
My first time in Cancun. Loved CANCUN and the people... This hotel is definitely one of the best hotels I've stayed at, comparing it to hotels from Cuba, and D.R. Our view from our room 425 was great, couldn't ask for a better view, we had room service delivered to our room, every other day for either lunch or breakfast or evening snack, the FOOD WAS ALWAYS GOOD. I wasn't a fan of Big Bens Restaurant but the Buffe (mexican food) was amazing, and the Italian restaurant made an amazing lasagna. My 2yr old my 6 year old my husband and myself all enjoyed the food, even when we weren't hungry and took kids to eat, we HAD TO EAT cause it was so delicious. Only thing we were upset with was the Adult pool closes at 6pm, yet the other is open til 10pm. ALL and ALL staff was great and we had an amazing 9 days at this hotel and would Go back again! "Perfect place perfect staff perfect holiday :)"
Me and my partner stayed here this year in September. We found the hotel to be very clean and well presented. The food was lovely lots to choose from. The staff were amazing! I had to see the doctor while I was there he was so friendly he instantly put me at ease and got me back to health, the receptionists were very caring, helpful and professional while I was feeling unwell. The entertainment was very varied from shows at night to keeping us happy throughout the day. Cannot fault the waiting staff who were there for your every need and constantly providing us more comfort throughout our stay. A special mention to a few of the staff Veronica Lopez who made our stay even more enjoyable she was extremely welcoming and managed to put a smile on our face every day :) Also all of the entertainment team with recognition to Ross and Mr Eddie who had us laughing for our whole two weeks stay and kept us busy with games and activities. Definitely going back next year A true taste of paradise! "The is truly a great hotel. We felt at home in paradise!" The staff made me feel like i was at home with their great service! Special thanks to Elpidio Penna Ibarra for the best birthday ever. My wife was literally treated like a queen within a days notice for her birthday party! We visit this hotel 3 times a year and it keeps getting better. This hotel deserves another star for their rating. This staff is top notch and go out of there way to make you feel at home as well as in paradise. Management is solid from the top down! Rooms are beautiful no matter what view you have. Best hotel we have ever stayed at in Mexico and we look forward to many more visit there. "Holiday Oct. 2014 Mary and Paul from Scotland"
My wife and I have just returned from two weeks at this hotel and think it was one of the best holidays ever. We found all the staff to be very friendly and helpful and special mention to Deisser Lopez Capitan of the Porto Fino restaurant in the hotel who went out of his way for his customers. Also a mention for a couple of the pool entertainment team who also went the distance to ensure everyone there had a great time. Thank you to Paulina and Leonardo. We found the food excellent along with the bars. This was a lovely hotel to stay in, with lots of different food courts, bars and activities if you really wanted you needn't ever leave the hotel (however I recommend getting out there to explore). The only down side would be theres not too much walking distance around the hotel other than the stunning beach of course however busses are so frequent they arrive almost every few minutes and are very cheap. There is however a fantastic museum five minutes down the road that has ruins in a jungle bit as well as a great exhibit of mayan culture. If you book an exurshan they will pick you up right outside the hotel lobby so you can sit with a coffee waiting on the buss - no hassle. Theres also clubs down the road that are massive if you want to have a good night out - can easily get bus there and back. The staff where all very friendly always greeting you with a smile and a special mention should go to Guillermo who was an amazing bar tender, never forgot my regular drink (which he also never let my glass go empty) and as soon as he found out I loved cherries he would present lots of them to me every time I went up to the atlantas bar. The food was adequate, nothing too amazing (apart from the adult restaurant) but I had no issues else where and lots to choose from too, theres a buffue during the day that I wish kept open later on at night however but I did have 24/7 room service that was always very prompt. The rooms where clean and the beds where huge, the balcony showed a lovely view of the sea - got to watch lighting storms out at sea most nights. overall I had a fantastic time, I went on this holiday with friends and would definitely recommend it to anyone wanting to stay in mexico! We traveled as a family of four (2 kids 8&11). We had a relatively stress free week. We didn't get "the lay of the land" until our second day there. The entertainment staff kept people active around the pool. Leo and Paulina helped people have a good time. The shows are not Vegas shows, but very entertaining. Service was very good and all of the employees were very helpful. The Kids Club is a great help for parents wanting a couple of hours to themselves. The food was good, and there was a wide variety of choices. We were pleased with our experience and would recommend the resort to others going to Cancun. We stayed for two weeks at this resort, a wonderful experience. Our stay was at a club suite(upgrade), the staff, the food and overall service excellent. Actually we were booked to stay at the Adult resort but found the Family resort to be much nicer and we were upgraded to this location not far away.. We also benefits from extended check out timing. Thanks you to the management and staff of this resort. We will be back in December. This hotel gave everything you could have wanted for a stay in cancun. Right on the beach, extremely clean, great location for nightlife, staff friendly, food ok! Food in the restaurant could be improved as was pretty average but the Japanese restaurant was excellent! All round enjoyed our stay. Room service is very slow, especially for food - expect up to an hours wait! "Top Notch Staff, Clean Rooms, Talented Entertainment"
We just got back from a week stay at the Parnassus with our 3 children and my husband's family. We had an amazing visit. The best bartender far and away is Fernando at the Lobby Bar. Always friendly and took care of everyone. The accommodations at this hotel are pleasant. The rooms are always clean and the staff makes sure that you are comfortable. We were there on the off-season, so not all restaurants were open everyday, but those that were were decent. However, the staff, rooms, and friendly people made up for it! Myself, my partner, sister and father recently stayed 2 weeks at the great parnassus. We had the best time! Check in was fast and easy, we were offered a free upgrade to a room with a jacuzzi. The room itself was clean, spacious and nicely decorated. Air con was fab and a god send, bed was firm but comfortable. There was a huge variety of food to suit all nationalities and the fussiest of eaters. Big Ben restaurant fillet of beef was to die for! We mostly ate at the buffet and poolside snack bar. The drinks here are brilliant, just ask the bar tenders and they will whizz you up one of their tasty cocktails, with all top branded spirits. The staff here are amazing, they will go above and beyond to help you. In the whole two weeks i came across one waitress who floated between the creperie and kilimanjaro bar, she was extremely miserable and came across very rude at times. I have to mention Eduardo and Irving (buffet), Veronica and Abigail (poolside waitresses) these people were the friendliest and most hardworking they made our stay so much more special. There is entertainment every day and night, the entertainers ross and edgar are hilarious, friendly and make a huge effort to get everyone involved in the various activities. There is so much more i could say about this place.....all positive..... but my review is big enough! Feel free to ask me any questions. I cant wait to return to Great Parnassus it was unforgettable!! "Great staff & great for families (Sep 2014)"
The hotel is great for families and kids, hence bunk buds being available in some rooms, and why we chose this resort. There was an adult only pool and area, but we never visited it. The guests were a great mix of Europeans, Canadians, Americans, and Mexicans, with plenty of kids for ours to play with. The staff were extremely nice and helpful. We would like to give special thanks to Alex (bartender at swim-up bar), Christian (El Maguey restaurant), Alberto Espinosa (waiter at food court area), and Victoria (pool area) for their exceptional service. "Staff members making an excellent effort!" We stayed at the Great Parnassus in September of 2014 and had a great and most pleasurable stay! My wife, myself and my 4 year old daughter were treated like royalty! We are a family who live in the U.S. and realize how important it is that your staff put on a smile and at least say hello and make eye contact when engaging customers. At the Great Parnassus that is exactly what they do! We would like to say thank you to all staff members at this hotel for their appreciation of us, having choosen their hotel! We would return again! I would like to make mention of our waiter who greeted us every morning with a smile and made sure to have fresh coffee at our table before we even got up to select our breakfast and his name is Lucio Kavil! Thank you to all staff at this hotel for having fun with us and making our first trip to Cancun, Mexico a great one! We stayed here on our first trip to Cancun. Nice variety of restaurants. Fantastic beach! The hotel has awesome architecture, as well. Inside it feels like two cruise ships docked side by side. Also, got to enjoy the facilities at sister resort, Golden Parnassus. Regular Rate $ 1512 . Today Only $399!